Building off the immensely popular Street series, the EVO One claims to have the same comfort and ‘wear anywhere’ feel in a high performance, waterproof package. Taking both comfort and performance to new levels, the evolution of ECCO’s best-selling golf shoe continues with the Street Evo One. This stylish, performance based men’s golf shoe features Hydromax™ technology, flexible light weight construction and a low profile for greater stability, feel and power. It’s the complete shoe for the complete golfer. Strategically wider toward the rear, and showcases a midsole that incorporates a specialized shank piece. This wraps the outside of a player’s heel, creating an exceptionally stable platform from which golfers can power through each shot. An ECCO developed treatment used to make leather highly water repellant. This special process actually keeps the leather from hardening after repeated wetting and drying, keeping it strong and durable, yet soft and breathable. A technology we have developed and improved over many years that enables us to make shoes that are soft, flexible and light, with extremely anatomical shapes. Basically, we inject a resilient, shock absorbent material into a foot shaped mold. This lets us bond the sole directly to the upper without glue or stitching. The resulting anatomical fit, integrated shock absorption, and hyper flexibility is the ideal material for outdoor performance. ECCO typically stands apart with quirky modern styling, and the EVO One showcases that quite well. Casually unique is probably the easiest way to describe the looks of ECCO’s latest Street shoe. While quite lightweight in hand, the EVO mixes a number of textures that give it both suppleness and the feeling of durability. The toe cup is constructed a slightly firmer feeling material, which indicates it will wear well with the demands of a walking golfer. At the same time, the toe area is by no means rigid and the leather upper is soft and pleasant to the touch. The rear foot area of the shoe is yet another material that is somewhat textured. There is moderate concern that this area will be difficult to clean. 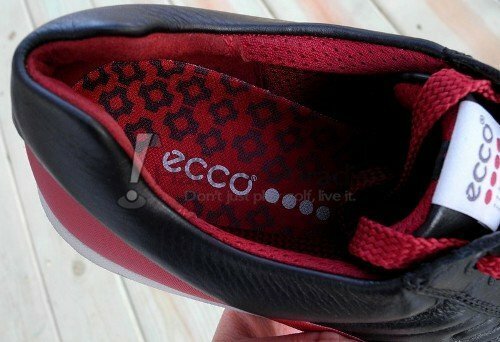 Never a company to shy away from bold color combinations, ECCO is offering six colorways, with Black/Port being the version that THP tested. Those in the market for a less conspicuous looking shoe may still find what they are looking for within the line, especially since each pair comes with a second set of laces that matches (rather than contrasts) the primary color. The pair tested came with a set of black laces as an alternate, which completely changed the look of the shoe. ECCO typically lists their shoes according to European sizing, which can cause some confusion for consumers used to US sizing, but they do offer a general guide for conversion on their website. While at first glance the EVO One appears to run on the smaller side, testing showed that it actually ran about a ½ size larger than what ECCO advertises on their conversion table, especially in the toe area. This was actually a great benefit to the shoe’s overall comfort, as the rear foot area felt very secure and stable, while the toe area provided plenty of ‘wiggle’ room. A size 44 (10-10.5 US) fit much like a typical size 11 US. As mentioned, in appearance the EVO One seems smaller than it actually is, but once put on it offers plentiful room and great comfort. Those people that hate the feeling of constricted toes will certainly enjoy what is offered here. On the foot, the EVO One feels light and roomy, yet stable and secure. Though technically a ‘spikeless’ shoe, the EVO One has one of the most aggressive set of nubs available on the market. As evidenced by EDTS technology, ECCO put a great deal of energy into giving their Street series a ton of traction, and they are easily a leader in the class. Though they won’t replace a true spike, the traction bars provide ample grip on the ground that should work for most players. Durability is often a concern for those unsure of making a move to spikeless shoes, but history has shown the brand wears very well. Comfort, lightweight performance, stability and modern style all combine in the Street EVO One to make a shoe that promises to be very popular in 2014. If possible, attempt to try the shoe on in person before purchasing, because it did appear to run a bit large. Though it’s not a style that will draw in some with more traditional preferences, those golfers looking for a unique look built on one of the industry’s most solid platforms will find much to enjoy. 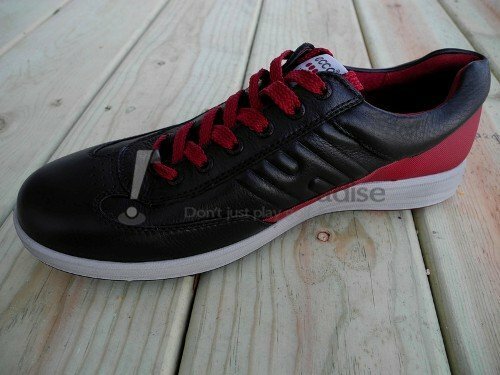 The Street EVO One retails for $160 and more information is available on ECCO’s website. Looks a really nice shoe. Definitely a great option for walkers who want a comfortable shoe with performance. Thank you for another great review Ryan, I really like the look. I agree with trying on ECCO’s before buying, mine do fit perfectly. I am a tweener size wise and these fit me in the smaller of the 2 sizes that I wear. Great review, and really appreciate the info about the sizing. 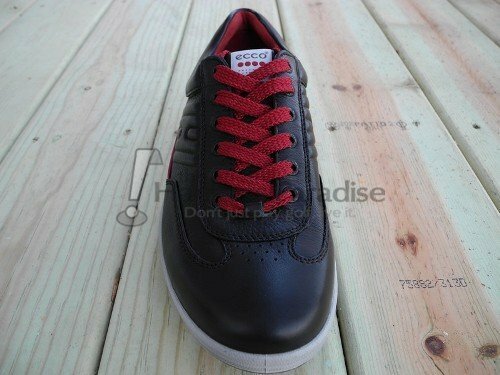 I have to say, of the colors offered on the ECCO website, black/port is my favorite offering. I’m one who has never tried spikeless shoes due to a concern for the durability of the nubs, but it sounds like that shouldn’t be an issue with these and I’ll have to see if I can give them try. Another great review packed with info to help the consumer. Great info Ryan and have to agree on the sizing. When I’ve tried them on, some of their models are one complete size difference. Thank you. Great looking shoe! Thanks for the review! Thanks for the great review Ryan. Ecco golf shoes are by far my favorite–but only after finding my right size. For me they run a whole size big. I think the color scheme is pretty unique for these, and I like to wear them to work on golf league days; the second color option for laces might just mute that look enough to pull if off. 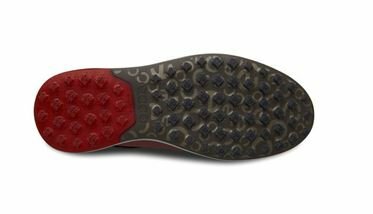 I found the traction of previous Ecco spikeless shoes to be excellent and the durability of the nubs decent over the course of a year–especially with me wearing them as much off the course than on. Nice job here Hawk – I think “casually unique” is a great way to describe these. The previous Streets looked a bit like skateboarding shoes to me so I really appreciate the updates they have made in addition to adding the hydro max technology. The fact that these have the leather rather than a more suede type of material is also a big plus with me for ease of wiping down/cleaning. And of course, Ecco makes some of (if not the) most comfortable golf shoes on the market. Great review Hawk! Ecco’s shoes seem to top quality from a feel and visual inspection. I just picked up a non golf pair and am looking forward to weather decent enough to wear them. I would like to have a pair of these in a different color scheme. 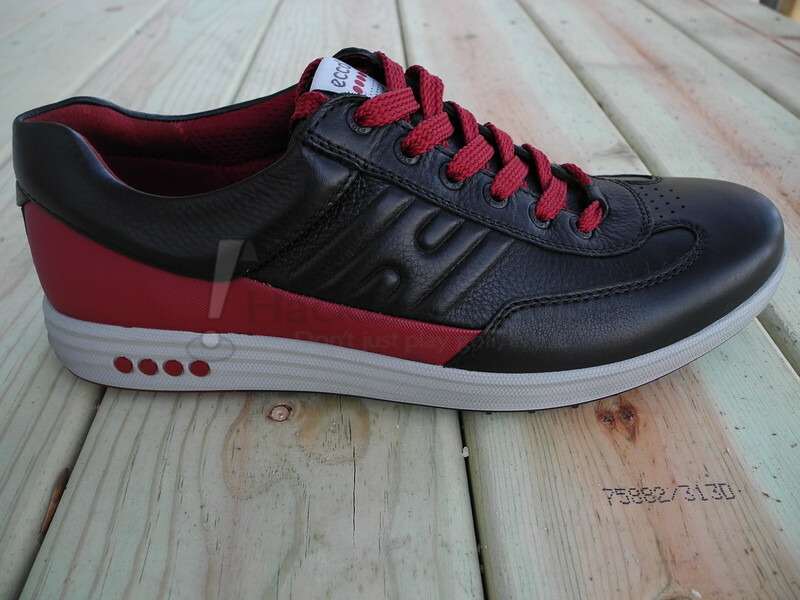 Ecco makes quality and comfortable shoes. Thanks for the review Ryan! The color and styling on these look great, glad to know they function as well!